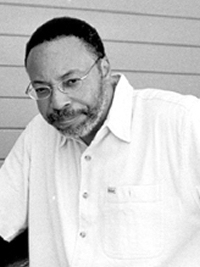 Librettist, novelist, playwright, poet, screenwriter, and scholar, George Elliott Clarke won the Governor-General's Award for Poetry in 2001 (for Execution Poems); in 2004 he received the Martin Luther King Jr. Achievement Award. In 2005 his work attracted the Pierre Elliott Trudeau Fellowship Prize. In 2005-6 he published his first novel, George and Rue, in the US, UK, and Canada. His second novel, The Motorcyclist, will be published by HarperCollins Canada in February 2016. The William Lyon Mackenzie King Visiting Professor in Canadian Studies at Harvard University in 2013-14, George Elliott Clarke remains the Poet Laureate of Toronto (2012-15). Now back at the University of Toronto as the E.J. Pratt Professor of Canadian Literature, Clarke’s newest book of poetry is Traverse (Exile Editions), an autobiographical poem. The facts are clear-it was, by all accounts, a slug-ugly crime. Brothers George and Rufus Hamilton, in what was supposed to be a simple robbery, drunkenly bludgeoned a taxi driver to death with a hammer. It was January 1949, and the two brothers, part Mi'kmaq and part African, lived in the dirt-poor settlement of Barker's Point, New Brunswick. Less than eight months later, they were both hanged from the gallows for their crime. Those facts are also the skeletons in George Elliott Clarke’s family closet. 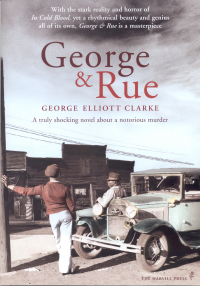 George and Rufus Hamilton were the author’s matrilineal first cousins, once removed. Despite the fact that the crime lives on in Fredericton, where the murder site is known as “Hammertown”, Clarke knew nothing of this chapter in his family’s past untilhis mother told him about it in 1994. Both repelled and intrigued by his ancestors’ deeds, Clarke set out to discover just what kind of forces would reduce a man to crime, violence, and ultimately, murder. 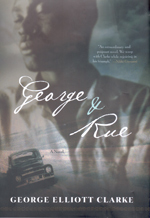 The results are an award-winning book of poetry, Execution Poems, and now George & Rue, a richly evocative fiction debut from one of this country’s literary luminaries. The novel shifts seamlessly back through the killers’ pasts, recounting a bleakly comic tale of victims of violence who became violent themselves, an Africadian community—Three Mile Plains, Nova Scotia—too poor and too shamed to help the men, and a white community bent on condemning all blacks as dangerous outsiders. George Elliott Clarke has written a horrific—and horrifically funny—story that is also infused with a sensual, rhythmical beauty.